My never-ending story with silver holos is still on the table. One of my strongest lemming is GOSH Holographic, since 2010 when I saw this photo at Lacquerized. 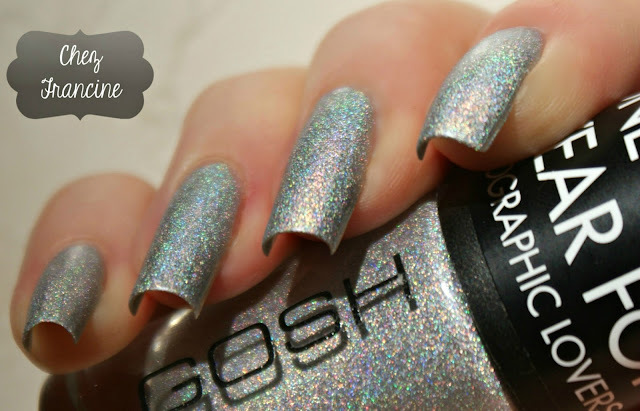 It was an instant crush and I badly wanted it but it wasn't easy find Gosh Cosmetics here in Italy and it was not possible to find Holographic in italian stores (Heavens knows why!). 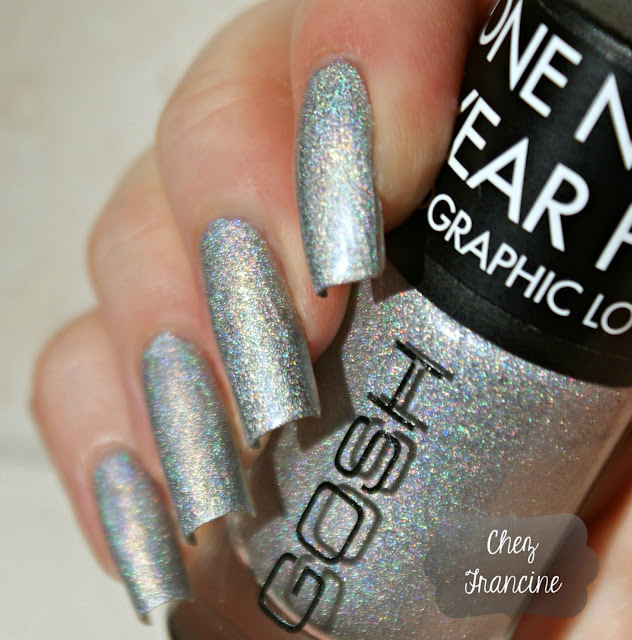 I was not willing to spend too much for a single bottle of discontinued nail polish, so I screamed out loud when I discovered that GOSH have re-released Holographic a couple of years ago. Hi, I'm Francine and I'm a NPA. And this is my love&hate story with GOSH 549 Holographic Hero. Il mio amore con gli olografici color argento è sempre vivo e attivo. GOSH Holographic è stato un colpo di fulmine sin da quando ne vidi una sola, singola foto sul blog di Michèle, Lacquerized (2010). purtroppo, la Gosh non è una marca che si trova facilmente in Italia e quei pochi negozi non hanno MAI Holographic (sa il Cielo perché!). Siccome non avevo alcuna idea di svenarmi per una boccetta, ho lasciato il mio amore a sospirare da lontano, finché, saputo della riedizione di Holographic, ho fatto i salti dalla gioia, gridando a squarciagola (risata satanica in sottofondo). Ciao a tutti. Io sono Francine e questa è la storia del mio amore travagliato con Gosh Holographic. Last december I was in London to pay a visit to my younger brother, when I stumble upon one of Superdrugs store in the city. I founded so many bottles of Holographic (Hero) into the shelves I thought I was already knockin' at Heaven's doors (No, I haven't hearded Axl Rose's voice, thanks Gosh!). I bought this little baby and I carried home with me. I have waited few months after trying it, because you need a dazzling sun to enjoy properly such linear holo. And as you can see by the photos above and below, there was a trick. This is a re-released, ok, but the linear effect is softed. It is not what I was looking for and I'm a little bit disappointed. I should have made some researches in the internet before buying this nail polish (and maybe I should have pay more attention at its name!). Anyway, you can see two coats of GOSH Holographic Hero over my base coat (KIKO Strong Nails, FYI). I did not used any trick like an watery base or a matte top coat layered between the coats. An easy-peasy job. 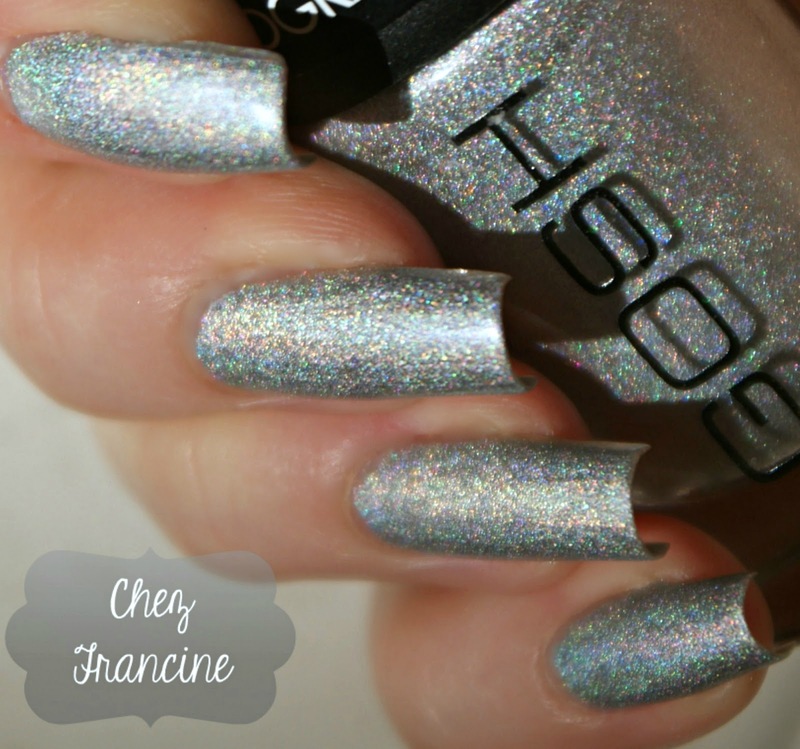 GOSH 549 Holographic Hero is still a silver based linear polish, but the linear effect is weak, like if it was the child of an astonishin' linear holo (like China Glaze OMG!) and a shy scattered holo (like Shaka Silver Holo lott. B). GOSH Holographic Hero è la riedizione di Holographic dell'anno di grazia 2009. Si tratta sempre di un olografico lineare a base argento, però - e che però! - l'effetto dell'arcobaleno è smorzato, come se questo cucciolotto fosse il figlio di un linear spaccaretina (ogni riferimento a China Glaze OMG! è puramente casuale!) ed un timido olografico diffuso (come il lott B di Shaka). Che delusione! Sì, avrei potuto informarmi meglio, prima di comprarlo ad occhi chiusi; però, uffa uguale! In tutte le foto a commento, ho usato due mani di GOSH 549 Holographic Hero sopra la mia solita base (KIKO strong Nails), senza alcun trucchetto come l'Aqua base di Nfu Oh o il top coat matte. Una passeggiata da stendere, ma veloce a scheggiarsi! If you are looking for a dupe of stunning linear holo (Chanel Holographic, Nfu Oh 61, China Glaze OMG! etc. etc.) 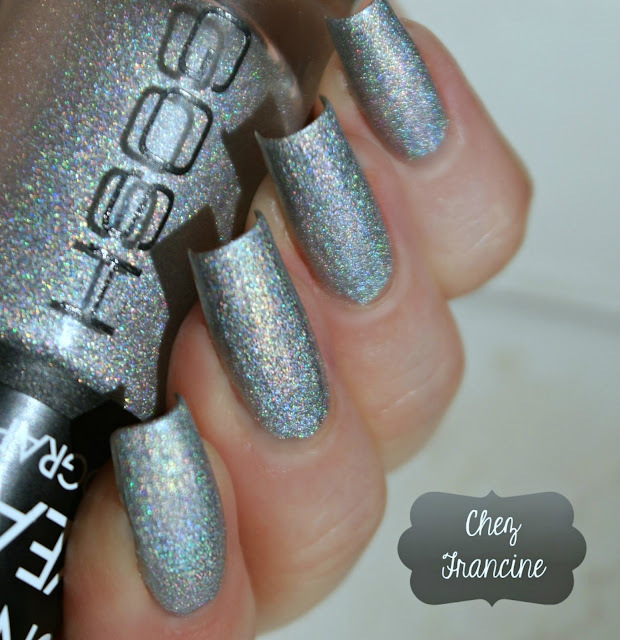 OR you just want admire a stronger holo line over your nails, skip this baby and spend your money buying something else, like Color Club Harp on It. Did you have bought a nail polish that has disappointed you? What have you done? Did you have kept the baby or have you found a new home for it? I think I'm going to keep this baby with me. Ok, it is not what I was looking for, but it wasn't its fault. I'm sure my mates' picks shall be amazing as usual. Don't miss theirs blog, you could reach them clickin' on the InLinkz board or surfing through our Pinterest board. Orbene, se cercate un dupe per un olografico lineare con tutti i crismi (Chanel Holographic, China Glaze OMG!, Nfu Oh 61 e via cantando), o volete un arcobaleno più deciso, ignorate lui e spendete i vostri soldini per qualcos'altro, tipo Color Club Harp on It. Avete mai acquistato uno smalto che vi ha deluso? Che avete fatto, dopo? L'avete tenuto lo stesso, oppure gli avete trovato una casa amorevole? Io terrò comunque questo smalto. Non è colpa sua, diciamocelo, ma mia, che non ho controllato meglio, prima di acquistarlo. Sono sicura che anche quest'oggi le mie amiche saranno agguerritissime e avranno tirato fuori dei signori smalti. Non dimenticate di curiosare nei loro blog! 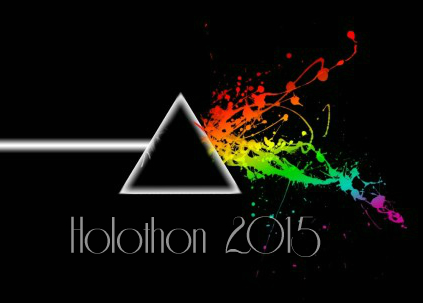 Potete raggiungerle cliccando sulla bacheca InLinkz oppure in quella di Pinterest dedicata ad Holothon 2015.